Editors Official | We are really sad to say that Editors have to cancel tonight’s show in Aberdeen. Tom has been struggling with a deep cold over the last few days and during today’s show soundcheck it became obvious that he cannot sing anywhere well enough to give you the show that Editors would want to give you. The band were very much looking forward to playing tonight in Aberdeen and are gutted that the show cannot go ahead. We will look into the possibility of rescheduling the show. Ticket refunds are available from place of purchase. 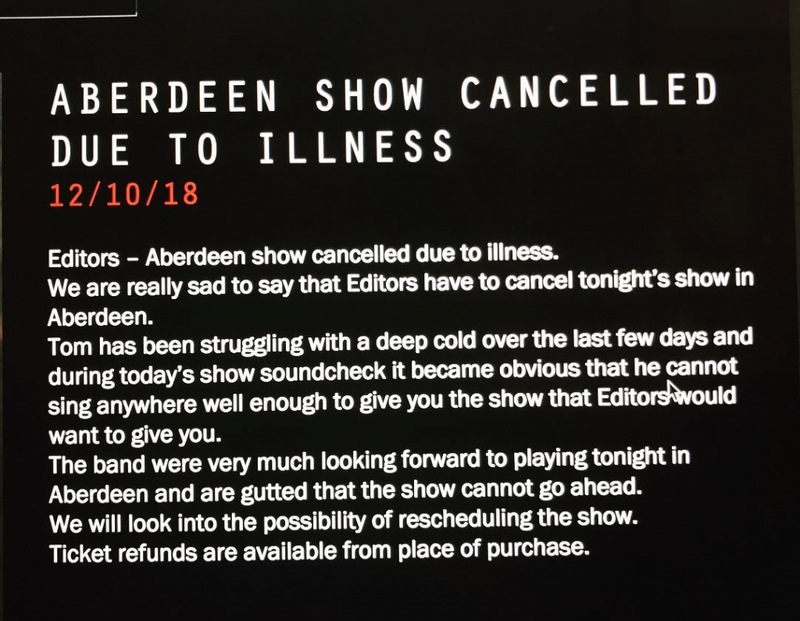 We are really sad to say that Editors have to cancel tonight’s show in Aberdeen. Tom has been struggling with a deep cold over the last few days and during today’s show soundcheck it became obvious that he cannot sing anywhere well enough to give you the show that Editors would want to give you. The band were very much looking forward to playing tonight in Aberdeen and are gutted that the show cannot go ahead. We will look into the possibility of rescheduling the show. Ticket refunds are available from place of purchase.